Find more examples of wood or Alabaster sculptures by clicking on an image. The holder is sold without the wine,glasses or bottle stopper but it is one of the best holders around. The wood is ambrosia maple and finished with danish oil and a fine "poly" finish of natural color. $55. The Banksia Pod can only be found in one location in the entire world. They are grown naturally and on farms around the Perth area of Australia. The kaleidoscopes are very unique for the fact that only one is created per show and one is displayed for sale at the Arati Gallery. These are produced on a very limited basis. No two are exactly alike. $60.00. More exciting new products click here! The sleek black color of the buffalo pen is like no other. These pens reflect your image when signing documents. They are available as a Special Order in fountain and roller ball. $75- $80. 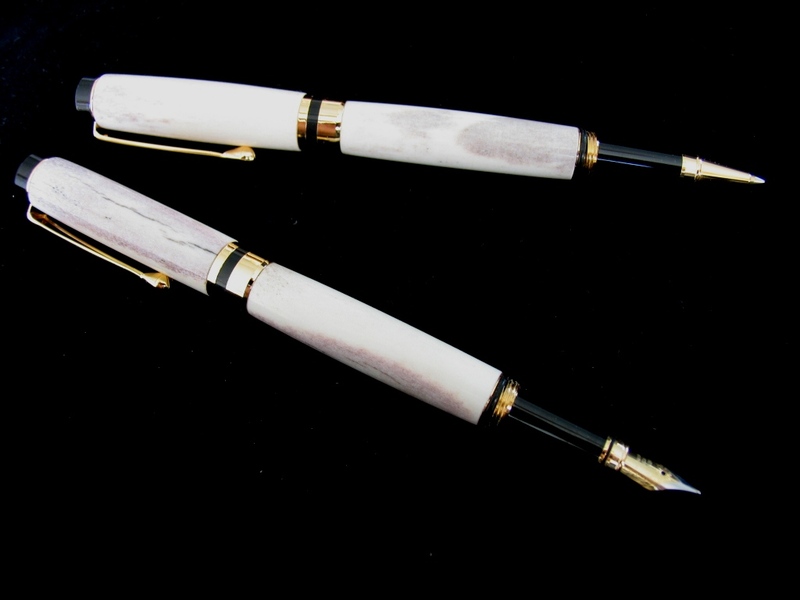 The rich texture of the turned antler pen can truely only be described by holding the pen in your hand. I have both the fountain and roller ball pens available for custom order. They are available as a Special Order for $80 and $75 respectively.